Dr. Brian Dawson always appreciates feedback from his valued patients. To date, we’re thrilled to have collected 19 reviews with an average rating of 4.95 out of 5 stars. Please read what others are saying about Dr. Brian Dawson below, and as always, we would love to collect your feedback. On time, quick, and focused, as usual - thanks, Dr. Dawson. Easy forms, friendly staff, no wait, clean facilities. 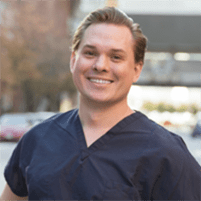 Dr. Dawson is friendly, kind, and he explained all the ailment and the treatment options clearly and exhaustively. Dr. Dawson is patient with his patients! He is also knowledgeable, supportive and approachable. I've had two very different injuries and he has been helpful both times. He also has a nice demeanor which I really appreciate! Dr Dawson took the time to thoroughly explain what was happening to me. He answered all my questioned and to very good care of me. Dr. Dawson and the staff were great! The front desk staff are efficient and pleasant. Dr. Dawson is thorough and quite informative in explaining the issues and treatment. Dr Dawson was kind, thoughtful, and patient -- not arrogant like many doctors. Listened to my concerns and worked *with* me rather than *for* me. Great experience all around. As always, Dr. Dawson was able to figure out my problem and provide a solution, all while patiently answering my questions. Highly recommend! Dr. Dawson is very knowledgeable and professional. He will give you options regarding your course of treatment. I will only see him when it comes to the treatment of my feet. Thorough and professional. Understood my concerns and discussed all the available treatment options. great experience, appreciated the extended time spent going through options. Dr. Dawson's bedside manner is excellent. He fully explained the why, how, what and even the when. He gave me options and really made me feel as if I had the tools I needed to deal with my condition. I highly, highly recommend him. Most doctors hear about an injury and immediately sideline you from your life. Dr. Dawson was very understanding and thorough in his diagnosis and made sure to tailor my recovery path to my athletic goals. A doctor that listens and has the most up-to-date tech and methods for treating his patients. Dr. Dawson is terrific and so is his office. The desk staff was friendly and on point. Dr. Dawson spent a full hour with me carefully examining me, explaining my ailment, taking X-rays to confirm his diagnosis and even fashioning a special insert for my shoes on the spot so I could walk out of the office in far less pain than I walked in. I have a treatment plan, meds to help with inflammation, a follow up visit and as well as a plan for PT to be sure my foot is strengthened so my injury doesn't present itself again. I feel extremely well cared for and so will you! Friendly, warm, patient, and very nice. Honest and straight forward. If you are unsure if we accept your insurance, please call our office.